With a mean radius of 24,622 ± 19 km, Neptune is the fourth largest planet in the Solar System. But with a mass of 1.0243 × 1026 kg – which is roughly 17 times that of Earth – it is the third most massive, outranking Uranus. Due to its smaller size and higher concentrations of volatiles relative to Jupiter and Saturn, Neptune (much like Uranus) is often referred to as an “ice giant” – a subclass of a giant planet. As with Uranus, the absorption of red light by the atmospheric methane is part of what gives Neptune its blue hue, although Neptune’s is darker and more vivid. Because Neptune’s atmospheric methane content is similar to that of Uranus, some unknown atmospheric constituent is thought to contribute to Neptune’s more intense coloring. Also like Uranus, Neptune’s internal structure is differentiated between a rocky core consisting of silicates and metals; a mantle consisting of water, ammonia and methane ices; and an atmosphere consisting of hydrogen, helium and methane gas. It’s atmosphere is also divided into four layers, consisting of (from innermost to outermost) the lower troposphere, the stratosphere, the thermosphere and the exosphere. The two main regions of Neptune’s atmosphere are the two innermost ones: the lower troposhere, where temperatures decrease with altitude; and the stratosphere, where temperature increases with altitude. Within the troposphere, pressure levels range from one to five bars (100 and 500 kPa), hence the surface of Neptune is defined as being within this region. Neptune’s “surface” can therefore be said to be composed of about 80% hydrogen and 19% helium, with a trace amount of methane. The surface layer is also permeated by roving bands of clouds with varying compositions, depending on altitude and pressure. At the upper-level, temperatures are suitable for methane to condense, and the pressure conditions are such that clouds consisting of ammonia, ammonium sulfide, hydrogen sulfide and water can exist. At lower levels, clouds of ammonia and hydrogen sulfide are thought to form. Deeper clouds of water ice should be also found in the lower regions of the troposphere, where pressures of about 50 bars (5.0 MPa) and temperature of 273 K (0 °C) are common. The Scooter is another storm, a white cloud group located farther south than the Great Dark Spot. This nickname first arose during the months leading up to the Voyager 2 encounter in 1989, when the cloud group was observed moving at speeds faster than the Great Dark Spot. The Small Dark Spot, a southern cyclonic storm, was the second-most-intense storm observed during the 1989 encounter. It was initially completely dark; but as Voyager 2 approached the planet, a bright core developed and could be seen in most of the highest-resolution images. For reasons that astronomers are still not clear on, the interior of Neptune is unusually hot. Even though Neptune is much further from the Sun than Uranus and receives 40% less sunlight, its surface temperature is about the same. In fact, Neptune gives off 2.6 times more energy than it takes in from the Sun. Even without the Sun, Neptune glows. This high amount of interior heat matched with the coldness of space creates a huge temperature difference. And this sets the winds blasting around Neptune. Maximum wind speeds on Jupiter can be more than 500 km/hour. That’s twice the speed of the strongest hurricanes on Earth. But that’s nothing compared to Neptune. Astronomers have calculated winds blasting across the surface of Neptune at 2,100 km/hour. Deep down inside Neptune, the planet might have an actual solid surface. At the very core of the gas/ice giant is thought to be a region of rock with roughly the mass of the Earth. But temperatures at this region would be thousands of degrees; hot enough to melt rock. And the pressure from the weight of all the atmosphere would be crushing. In short, there is simply no way one could stand on the “surface of Neptune”, let alone walk around on it. We have many interesting articles about Neptune here at Universe Today. Here is one about the Rings of Neptune, the Moons of Neptune, Who Discovered Neptune?, Are There Oceans on Neptune? Astronomy Cast has some interesting episodes about Neptune. You can listen here, Episode 63: Neptune and Episode 199: The Voyager Program. THANKS! this website is really cool it helped me with my school project!!!!!! That seems like a bizarre definition of “surface”. Why didn’t they define is as the average point where matter is in liquid or solid form, or something like that? It just seems unhelpful to talk about a “surface” that is gaseous – that feels more like the opposite of “surface”. Does this definition only apply to gas planets? I’m fairly confident that the surface of Mars, Mercury, and Venus don’t conveniently sit a 1 bar. And if it does apply to gas planets only, what value do people get from this definition? Because there is no consistency when it comes to the depth liquid can be found on gas giants. On Neptune and Uranus, it can only be found if one ventures deep into the mantle region; whereas on Jupiter and Uranus, there’s liquid hydrogen nearer to the surface, but it is still too deep for scientists to determine where exactly it begins. In all cases though, that “surface” is too far from the upper layers to fit the name. And scientists use Earth’s standard (1 bar at the surface) because air pressure ranges wildly on the other terrestrial planets, from virtually none at all to 92 times that of Earth. You go with what you know. What a bunch of half truths, distortions and just plain wrong. Neptune has a surface, depending on the temperature it will be solid or liquid. Due to the pressure the ocean may be liquid hydrogen rather than water. Since the core approaches 7000 C, that surface is where temperatures could be unreasonable for humans. Without doing the math the temperature region for earth like would be most likely in the lower atmosphere far above the actual surface. A blimp would float there just fine. The people who write these pieces seem to know less about the subject than a third grader. 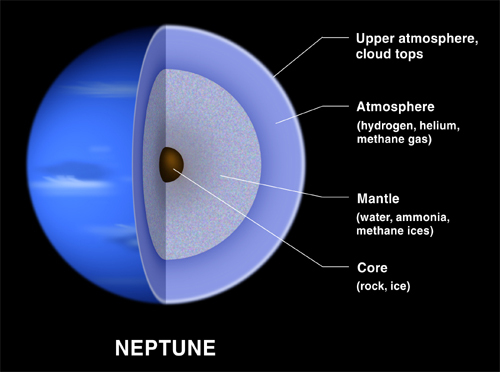 neptune has a solid surface, an ice surface and that is not the core. Even you graphic shows that yet the writer just goes on and on without a thought in their head. Neptune is actually pretty hot in the interior, about 7000 C, as hot as the surface of the sun. The only place actually cold is the cloud tops. As you descend the temperature goes up and at some point the planet has an ocean of water which you could float around in or on. The only drawback is the pressure would be a lot higher than the pressure on earth in the deepest ocean so you would die of the bends from the nitrogen in nothing flat if you changed altitude even a tiny bit upward. The best thing would be a blimp, you could float in the atmosphere at a depth where the temperature was earthlike and the pressure while thousands of pounds per sq in, would be much more bearable. First of all, the core consists of Rock and Ice, so it is cold. How is it possible if the atmosphere temperature in “unnaturally” high? Secondly, you say that solid surface consisting of rock has such high temperatures, that the rock would melt. So does Neptunes surface looks like hell with melted rock? Where is the ice in this case? You can trade low temperature for high pressure in order to make something a solid. Basically by squeezing the atoms close enough together, you just compress it so hard that it becomes a solid. Then if that pressure is strong enough to counteract the movement of molecules from the heat, it will remain a solid. The definition of “surface” (given in this article) is ridiculous. And we know nothing about the surface of Neptune, if it has one at all. It’s all guesswork at this time. Previous PostPrevious What’s Outside the Universe?